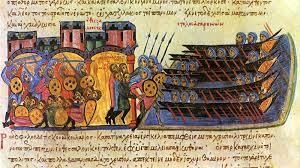 During the long Arab-Byzantine struggle for supremacy in the Mediterranean Sea from the Seventh to the fourteenth century an unexplored factor, of paramount importance, was their military naval intelligence. An attempt will be made in the present paper to present some facets of this complex topic about which little has been written. Naval intelligence starts from the ports. Arabic and Byzantine sources scrupulously describe how the defines of the ports must be organised in order to prevent infiltration by foreign ships and agents, while historical sources reveal that in spite of all precautions intelligence gathering continued to thrive. The play of cat and mouse never ended. The best instructions for protection against spying in general and naval intelligence in particular are to be found in a short manual on naval warfare inserted in the major work of Qudama bn. Ja’far known as Kitab al-Kharaj. In Ibn Qudma’s manual the Emir instructs the authorities to be vigilant with foreigners entering the Dar al-Islam. he advises thorough checking to ensure that they do not return to their countries with weapons or any war supplies. Likewise, the legislator Abu Yusuf in his books Kitab al-Kharaj states that foreign merchants in the land of Islam should be investigated and any weapons they possess confiscated; not even horses should be permitted to leave with them. This entry was posted in Articles and tagged 14C, Byzantine, early medieval, Islamic, Late Medieval, Military Orders, Muslim, Naval Warfare. Bookmark the permalink.